Another test to see if the horizontal output is running is to bring a neon or compact florescent bulb near it. The problem with that troubleshooting guide is that it was written the same year or the year after the set was built. If the set was only a couple of years old then a tube might be the only problem. But over the six decades since, now it is the capacitors and to a lesser extent the resistors that are probably the problem(s). Look at the LV (Low Voltage) level, also called the B+, it is probably low. If you want to, you can prove the horizontal circuits aren't working. Sometime ago I had a small neon bulb (NE-2) that had lost one of its wires. I taped it to a plastic straw and use it to probe the horizontal area. If things are working right it will glow a bit when held close to the horizontal output, yoke wire and horizontal output transformer. It works even better (but it is bulkier) with a compact fluorescent bulb. Keep the base away from your skin. Well I'm happy to report that after another tube order that didn't change things, I started to recap the tv, beginning with the C1 electrolytic cap. Frankly, it was the easiest one for me to see and replace. Following the great tip to make a change, then test the tv to ensure you know what change had what effect, I am not getting a raster on the tv! I'm going to replace all the electrolytic caps then the paper caps. I'm sure that this isn't the end and there will be more frustration along the way, but my confidence is growing and I'm excited to get a digital antenna and d2a converter tomorrow to work on getting a great picture. I'll keep you posted over the coming weeks as I take steps. Thanks for everyone's assistance and guidance! Sounds good. Once get to the point where the tubes are tested (except the CRT) and the capacitors are replaced you will be well on your way. May have to replace a couple of resistors. Hopefully by that time you should at least have a raster. Probably need to post the schematic here so we can help. If you have any questions on what something is or what you should do about something, just let us know. I would NOT do that in a pre-1960 Zenith...Back then they used a lot of wax-paper caps (some plastic encapsulated ones too) which do not hold up well with age. Odds are enough of those caps are bad that the set will not be capable of producing a raster until they are changed. I've owned over 10 monochrome Zeniths from 1951-70, and while the later ones tend to work as found, pre-60 stuff with paper caps usually need a recap. The lytics in pre-1960 stuff are usually starting to get leaky and go open/shorted. Some of my early 60's sets that worked as found on the original lytics have been blowing lytic sections every ~6 months of operation...If the cans ain't bad now they will be soon. Just recap it slowly testing for issues every few caps...It will save you a lot of headache. It may even just work properly after the recap. Geez, That set takes me back a few years, er decades.... I worked for a Zenith dealer way back when. Replace the filters first off. There are 2 places that can build you new ones, DH Enterprises and Hayseed Hamfest. Or you can rebuild them yourself. There are several postings on this site on how to do that. Also some YouTube videos too. No B+ will give you no picture. Sometimes the slow blow fuses would mechanically fail from age also. Just don't jump them. They are a safety device and parts for that set are pretty scarce now. If that uses the "C" type fuses, send me a PM with the value you need. Likely I still have some stashed away. "The average family has 2.5 children. Where is the other .5 child?" So I'm nearly done with the recap. Been testing resistors as I come across the opportunity to disconnect one end to test. and am struggling to figure out the resistance because I'm not as familiar with 5 band color coding. Between the orange and the blue, there is a band. When I test it on my ohmmeter at 20M, it starts in the 1-2M range, then rises quickly to off chart. There are no resistors greater than 10 Ohm in the docs. That is not a resistor, but rather what is known as a "bumblebee" type plastic encapsulated paper capacitor. Color code: first three bands are capacitance in PF (last being a multiplier like in a resistor) final band is voltage.... So what you have (Red Red Org Blue) is a .022uF (=22000 pF) at 600V. It also includes a chart to help you decipher the colored code markings. 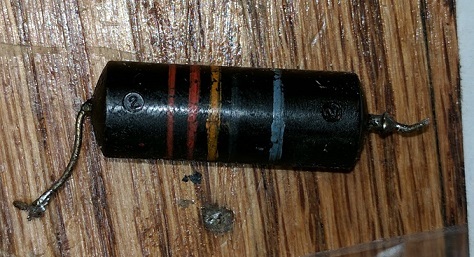 As noted, this is a plastic-coated paper cap, not a resistor. Those caps are so unreliable that I don't bother testing them. Thanks fior reminding me to RTFM (Phil's article). My fault. And wow those old bumble bee caps are worth something. Certain values of bumblebee caps are sought after by people restoring vintage electric guitars. Some only care about the appearance. Some believe that installing old caps like the originals will give them an authentic "raw" sound. I have tried to explain that the old bumblebees have become leaky from aging, and thus their fabled "raw" sound is likely distortion, not the sound made when those guitars were manufactured with new, non-leaky caps. That advice is ignored, but I guess they're not doing any great harm. Meanwhile, a few lucky folks can make a buck by reselling leaky old caps on eBay. I usually wait until I have 5 of them and then list them on ePay. A $100 bill later everybody's happy. I've salvaged maybe 50 of them and test each one on the way out the door. None have been shorted. Probably 40 have met rated voltage and perhaps could have been left in the set. Ten have shown leakage at rated voltage but showed fine at 200V or less. A guitar application is way less than that. I also have a Fender Stratocaster and can play chords. A decade ago I tried playing through a bumblebee, a brand new orange drop, and through a handful of "undesirable" vintage but not leaky caps. While I won't say the bumblebee sounded "better", I will say they all sounded different. Subtly different but different. To each their own. Because they do sound different and because I've never played a Les Paul, I won't jump anybody's case for wanting what they want. And I'm thrilled that I can defray a restoration cost now and then by selling the old caps to a Les Paul player. But I will say that likely no bumblebee is leaky at the milliamp levels of current coming out of a guitar pickup unless it's a dead short. I wouldn't call it "distortion" either. Maybe resonance would be a better description. A proper pluck of a Strat will peal like a bell. I think it's about getting the cap to sing along with the string. Resonance instead of clash. It's all very subjective so I wouldn't lecture a musician's"ear". Any more than a painter's eye or a dancer's grace or a drummer's beat. I also can't play my Strat well enough, despite years of practice. There's a certain genius to playing a guitar that is what it is, and if you don't have it I don't think you should tell someone who does that he is wrong. My 2 cents. Sell the bumblebee to someone who wants it. Buy a dozen new orange drops with the proceeds, and both parties walk away happy. 1. Changed the C1 and had raster. Quickly shut it off and posted on the site. 2. Changed the other 3 electrolytic caps (C2, C3, C4) and tested again. Received a raster and plugged in my digital antenna, d2a converter and started dialing in the picture (changing the picture settings from the front). Was receiving audio, then after 10 minutes, the picture went noticably darker so I quickly shut off the tv. Light on screen went to a center beam that took about 2 minutes to dim down to nothing. 3. I assumed that this was due to an old cap that failed so I went through and changed out all the old caps, including bumblebees, and now get a strong audio signal, but no picture. Based upon the comments earlier and some research on B+ voltage, that seems to be the likely culprit. 4. All tubes that can be checked, have been and I even have replacements for most of the tubes because I wasn't sure where the problem was. So I'm back to the initial problem with audio, no raster, but have recapped the tv and know that the CRT works (or was working). Any guidance on what to look at or how to test to zero in on the problem area is appreciated! Last edited by cvsolfari on May Mon 15, 2017 3:06 pm, edited 1 time in total. Please resize your attachments to 800 pixels at the largest dimension. This thread is very hard to read. If you have strong audio, but no difference in raster brightness (sync lines, noise, etc) even when adjusting the fine tuning, then you likely have a bad video detector or video amp system. Do you have a signal generator* that will work down in the audio band? If so you can isolate the problem to detector or video amp by injecting at the detector output there should be bark and light patches in the picture. If not suspect the video amp. I had a similar chassis that had a bad detector diode, and similar symptoms to yours. The diode will be inside the final vid IF can IIRC. *It may be possible to inject composite video from a cheap DVD player if a signal gen is not avail. I recommend using an isolation cap ~.1uF@630V between signal source and injection point to protect the signal gen.
Where is V7 in the above schematic? See V7 now? Oh, it's a 12AX7 AGC Keying tube. Its grid is at 7.6V. Which posts the image in hi def for downoading by others but displays them at the rescaled size for pleasant displaying. Currently our best solution is to host large images elsewhere and link them as external images. Problem with that is we end up with a lot of dead links yielding senseless posts over time. Storage space has gotten cheap over the years. Wonder if we could get Alan to enable the above img tag support... Haven't done php support lately but it seems plausible that the 800 pixel width could be defaulted somehow to enforce readability regardless of original document size. This problem happens enough that there ought to be a standard solution by now. I am hosting those images on imgur and have successfully done so in the past. Not sure why this is so bad. Try this one. It's a link to the entire PDF so that it scales appropriately without distorting this page. the above image is just one page of the entire PDF. Sorry for all the back and forth. I used Google Drive to share the PDF since IMGUR converted the file.